Nail biting is a common habit that affects a number of Americans including an estimated 60% of kids, 45% of teenagers, and 30% of adults. While the likelihood of being a nail biter decreases as we get older, the truth is it is a habit that can be difficult to break and can follow you into adulthood, and not without risk. If you do still bite your nails, you may already know the whole-body concerns associated with the habit. But at our dental office in Boerne, we also know nail biting can contribute to several oral health issues. According to the Academy of General Dentistry (AGD), people who bite their nails are at an increased risk for several oral health issues including chipped, cracked, or worn down teeth, damage to the gum tissue, and bruxism. Bruxism is the technical term used to explain tooth grinding and it can bring on a whole set of unique issues including facial pain, recessed gums and sensitivity, headaches, and tooth loss. Bruxism, as well as the other common ailments associated with nail biting, are serious and would require treatment from your dentist in Boerne quickly to help protect your mouth from further damage. Nail biting is a habit, and habits are hard to break. What can be helpful to helping you succeed at stopping is to identify why and when you find yourself with your fingers to your mouth. Do you notice it’s during periods of stress? When you’re bored? Do you not even realize you’re doing it? Work to identify the times you tend to bite, then try the tips below to help you quit. If your nail biting is triggered by stress, try to find an alternative stress reliever such as exercise, yoga, or meditation. Use a nail lacquer specifically created to help people stop biting their nails. It has a bitter taste that helps you to not nibble on your nails. Invest in getting a manicure regularly. This can be a great solution for both men and women since we tend to care for things a bit better if we’ve paid for them. Check out pictures of all the gross, disease-causing bacteria that tend to lurk under nails. Seeing what you could be ingesting into your body may just do the trick. As with any habit, you may not succeed at quitting the first time, and that’s ok. Stay persistent and keep trying different methods to find the one that works best for you. If you do happen to damage your teeth or your gums, or suspect you have bruxism, give our Boerne dental office a call to schedule an appointment. 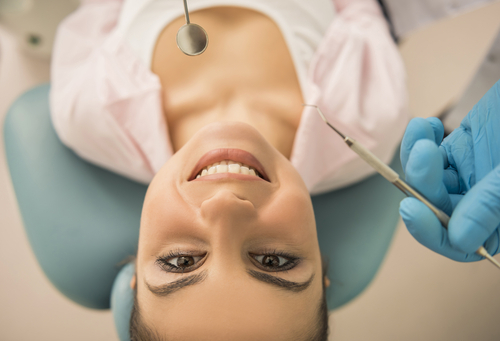 We’ll evaluate your oral health and discuss the most appropriate treatment for your unique situation. Gum, or periodontal, charting is when your Boerne dentist measures the pockets around each tooth to help evaluate oral health. It’s an important step in diagnosing gum disease and determining how advanced it may be. Periodontal charting can also assist your dental team in recommending an appropriate treatment plan. How is Periodontal Charting Done? The process is pretty simple and usually pretty painless, too. The team at our Boerne dental office will gently poke the six areas around each tooth to measure the pockets between the gum and tooth. You’ll hear us call out and record numbers, anywhere from 1 to 7, or sometimes more. The numbers are the pocket depth in millimeters. You want to hear lower numbers during your periodontal charting. Measurements between 1 and 3 are a sign that your gums are in good health. But, it’s worth noting that even if your pockets are between these ideal depths, if you bleed, it may be a sign of early gum disease. Pockets deeper than 3 millimeters could indicate a stronger likelihood of gum disease, or an advanced stage of it. Anymore than 3 millimeters could mean more serious issues. Check out the ranges and associated concerns below. 3 mm – 5 mm: Gum pockets with measurements that fall within this range is usually a strong indicator of moderate gum disease. 5 mm – 7 mm: Depths between 5 and 7 is almost a guarantee of gum disease. There’s also a risk of bone loss. 7 mm+: Any gum pockets that are 7 millimeters or more is a strong sign of advanced gum disease. Periodontal surgery may be recommended. Periodontal charting is an extremely reliable way to diagnose gum disease, but there are things you can keep an eye out for in between visits. Gum disease is a serious problem that can lead to tooth loss and, in turn, even more oral health issues. Not only that, gum disease can affect the whole body as well. Recent research shows a link between gum disease and heart disease, stroke, and diabetes. It’s not something to be taken lightly, so if you become aware of any potential signs of gum disease, we welcome you to call our dental office in Boerne to schedule an appointment. We’ll be happy to help.